Browse: Home / distro_checker v-1.0.1 released : Cross Distribution Exploit Testing. distro_checker v-1.0.1 released : Cross Distribution Exploit Testing. distro_checker is a Cross Distribution Exploit Testing. This allows to evaluate different scenarios and hopefully helps yours to make exploits a bit more robust. This includes a few simple vulnerabilities such as file permission, file race condition, environment variable code injection, etc. distro_checker is a Cross Distribution Exploit Testing. + docker_build.py: This script function is to generate images of each distribution and run docker_launch.py. 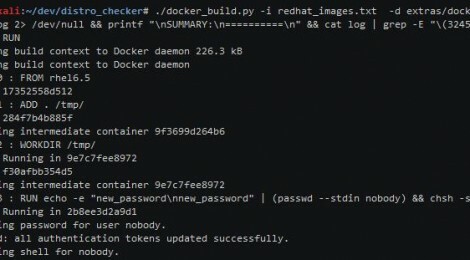 + docker_launch.py: This is the one that finally connects through the SSH and executes our command in the selected container. + images.txt: A list of images to use extras/: Libraries and base Dockerfile used for generation of the images. + root/: Here, we find private keys for the ssh connection, which are necessary for testing out the GUI tests. + Doing a similar process using Vagrant, we would be able to try out all kinds of vulnerabilities, as that would be a complete virtualization setting. ← Updates Msfvenom Payload Creator (MPC) v-1.3.2.